CLINTON, N.J. (December 17, 2018) - The New Jersey Bankers Association (NJBankers) has selected Unity Bank Senior Staff Accountant Delphine Marini as a New Leader in Banking. The NJBankers Rising Stars Awards recognizes the up and coming leaders in the New Jersey banking industry. Marini, a Flemington resident, is one of only 16 bankers under the age of 40 statewide selected for the prestigious honor from NJBankers, a trade association representing nearly 350 banks and service providers. Award nominees were judged on a range of leadership characteristics, including confidence, decision-making capabilities, and delegation efficiency; whether they have made a significant contribution to the bank, direct reports and peers; exhibiting maturity in communications skills; displaying self-motivation; and demonstrating good corporate citizenship through social and community commitment. Five independent judges reviewed the nominations with names and banks redacted. "Delphine has been a valuable member of our team for nearly six years and truly deserves this special honor," said Unity Bank President & CEO James A. Hughes. "She joined the bank shortly after graduating college and has excelled in multiple roles at Unity. We could not be prouder of Delphine as she is the perfect example of what a New Leader in Banking should be." Marini joined Unity as a Loan Servicing Specialist in 2013 after graduating from The College of New Jersey with a Bachelor of Science in Finance. She moved to bank's Finance Department in 2014 as a Staff Accountant and earlier this year became Senior Staff Accountant. A graduate student at Lehigh University, Marini will earn her Master's Degree in Business Administration with a concentration in Finance in January 2019. Unity Bancorp, Inc. (NASDAQ: UNTY), the parent company of Unity Bank, its primary and wholly owned subsidiary, is a financial services organization headquartered in Clinton, N.J. Unity Bank provides financial services to businesses and consumers at 19 branches throughout New Jersey and the Lehigh Valley, Pennsylvania. Unity Bank provides community-oriented commercial banking services, including deposit accounts, loans, online and mobile services. For more information, please visit www.unitybank.com or call 800-618-BANK (800-618-2265). The New Jersey Bankers Association has selected Unity Bank Senior Staff Accountant Delphine Marini as a New Leader in Banking. 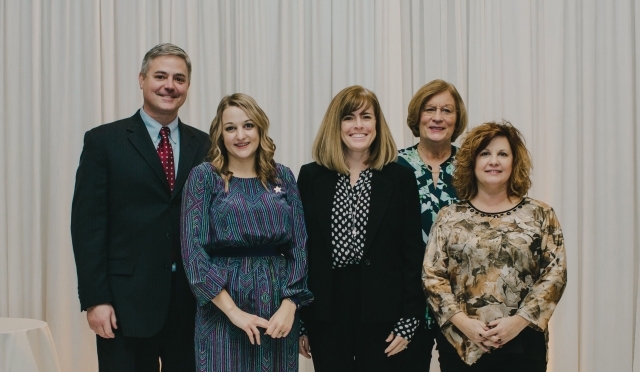 Pictured (from left) during the awards ceremony are Unity's Alan Bedner, Chief Financial Officer; Marini; Laurie Cook, Controller; Bridget Walsh, Human Resources Director; and Denise Stull, Assistant Controller.